Today’s students have access to plenty of technology—but is it making a difference in teaching and learning? Most studies suggest that in order for technology to impact student achievement, it needs to be leveraged in ways that transform how students engage with academic material and how teachers shape their classrooms and lessons. But it's not always easy to define what that actually looks like in practice. In order for a school or district to be able to measure the impact of technology on teaching and learning, teachers and administrators must have a common language to talk about what successful technology integration looks like. Rubrics can help school technology leaders define their goals for technology use in the classroom and evaluate the success of technology initiatives in meeting those goals. The three models of classroom technology integration below, while very different from one another, each can provide a starting point for thinking about how technology is used in the classroom today and what teachers and technology leaders may want to aspire to in the future. 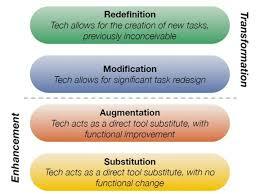 In the Substitution phase, we are simple using digital substitutes to perform the same tasks, with no functional change. For example, you may have students complete an assignment on a PDF and turn it in online. In Augmentation, students use a digital substitute that includes some functional improvements. In this case, students may use a word processing program with spell check and grammar check to complete an assignment. Modification involves significant redesign of the task to take advantage of the power of technology. For example, instead of simply completing an individual assignment, students may collaborate to create a shared project using Google Docs, or use media tools to develop podcasts or movies instead of a standard report. In Redefinition, students use technology to complete new tasks that would not have been possible without the technology. They may use Skype to connect with experts or with other students; use web tools to collect real-time information and data; or develop a wiki project with input from other students across the country or around the world. SAMR divides these approaches into “above the line” and “below the line” applications, with the assumption that teachers should aspire to moving “above the line” in their use of classroom technology. It’s important to note, however, that SAMR doesn’t dictate that ALL use of technology must be in the redefinition or modification categories; the task at hand will shape the way technology is used. Sometimes, simply saving time for teachers may be a good enough reason to use technology vs. pencil and paper, even if that technology usage isn’t “transformative.” Still, SAMR provides a compelling model for thinking about when, how and whether technology should be integrated into classroom tasks and lesson plans. 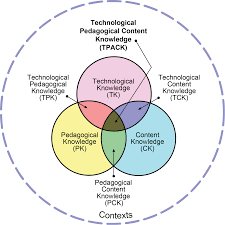 The Technological Pedagogical Content Knowledge (TPACK) framework provides a very different way of thinking about education technology. Rather than thinking of technology use along a hierarchy, TPACK places technology knowledge inside a larger framework of knowledge bases that teachers need to be effective in the classroom. The TPACK framework extends Shulman’s concept of Pedagogical Content Knowledge. Content knowledge (CK) is the mastery of the subject that they are teaching (e.g. earth science, algebra or English literature). Pedagogical knowledge is the mastery of the practices, processes and methods of teaching, including assessment methodology, lesson planning, classroom management and teaching strategies. Technology knowledge is the ability to work with technology tools and resources and apply those tools and resources in effective ways to the task at hand. “Underlying truly meaningful and deeply skilled teaching with technology, TPACK is different from knowledge of all three concepts individually. Instead, TPACK is the basis of effective teaching with technology, requiring an understanding of the representation of concepts using technologies; pedagogical techniques that use technologies in constructive ways to teach content; knowledge of what makes concepts difficult or easy to learn and how technology can help redress some of the problems that students face; knowledge of students’ prior knowledge and theories of epistemology; and knowledge of how technologies can be used to build on existing knowledge to develop new epistemologies or strengthen old ones.” (Koehler & Mishra, 2006). With TPACK, the question “how should technology be used in the classroom?” can only be answered in the context of the content being taught and the pedagogy being used. The TPACK website provides a large collection of free resources for teachers and other instructional leaders. Another way to think about technology integration is through a matrix. The Technology Integration Matrix (TIM), created by the Florida Center for Instructional Technology, is meant to be a comprehensive framework for evaluating technology integration in the classroom. Originally created to provide administrators with a resource for teacher evaluation, the framework also gives teachers a different way to think about their use of technology. Entry: Teachers begin using technology tools to deliver content to students. 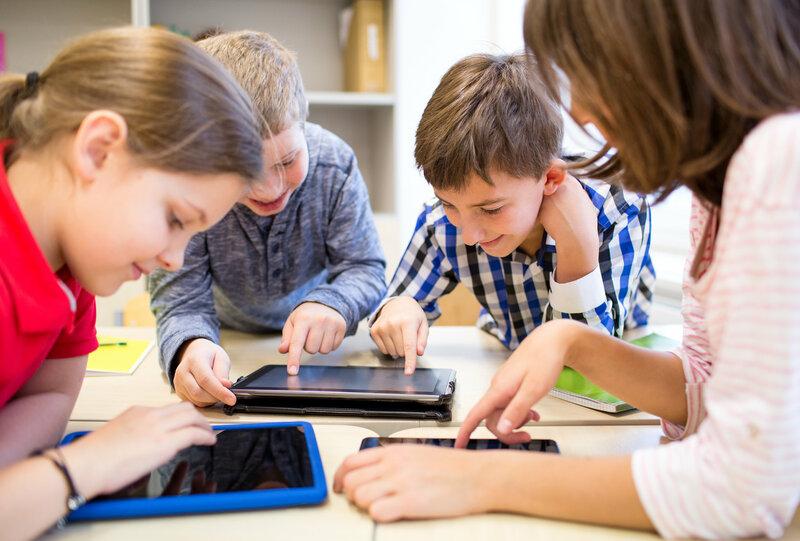 Adoption: Teachers are able to direct students in the use of technology tools. Adaptation: Teachers act as facilitators to help students find ways to use technology independently. Infusion: Students and teachers are comfortable enough with technology that teachers can define a learning objective and students are able to choose the appropriate technology tools to achieve it. Transformation: Teachers encourage innovative use of technology tools and use technology tools to enable higher-order learning activities not possible without the technology. Technology integration is measured in the context of each of these characteristics within a 25-cell matrix. In other words, a teacher may be at the Adaptation level in using technology to support constructive learning, but at the Infusion level in promoting collaboration among students. This provides a more nuanced look at how the teacher is using technology to support an effective learning environment. Each of these models of technology integration provides a unique and useful way to think about the ways we are using technology to support teaching and learning. What do you think? Does one model seem more useful—or usable—to you than the others? Have they changed the way you think about classroom technology? Let us know!